Year after year, we are seeing solar energy installations grow at a rate of about 12% globally. 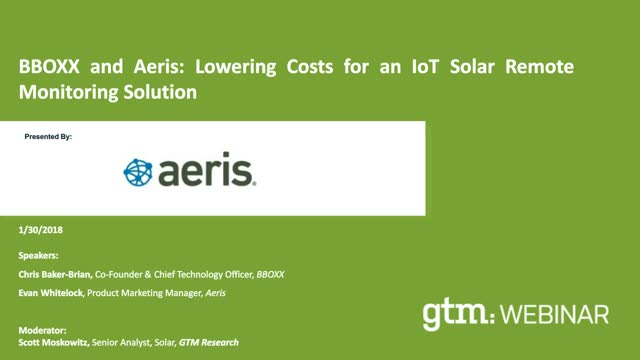 Join Chris Baker-Brian, Co-Founder & Chief Technology Officer, BBOXX, and Evan Whitelock, Product Marketing Manager, Aeris, as they discuss the challenges and advantages of a remote solar-monitoring solution. This hour-long webinar reviews connectivity options; discusses ways to attain operational efficiencies; talks about managing connectivity with multiple networks; asks and answers attendee’s survey questions; provides insights to flexible SIM lifecycle management and revenue-grade metering; looks at real-time troubleshooting; and ends with an in-depth Q&A. Watch this webinar to gain insights to BBOXX deployments and Aeris solutions. Listen in as Aeris CTO, Syed “Z” Hosain, talks about the state of medical monitoring in the age of IoT. In this webinar, you will get to hear of the challenges and opportunities, as well as the market drivers, for this fast-growing sector. Recently, participants from TU Automotive and Aeris sat down for an in-depth webinar on the challenges and solutions encountered by the evolving automotive technology segment as it converges with consumer electronics, mobile, and IoT to re-define connectivity, mobility, and autonomous use cases. • How do businesses increase usage without raising the cost of connectivity? • How do you manage multiple deployments on a single platform and still keep costs in check? • And, if a single, multi-tier platform can standardize processes involving multiple distribution channels and levels, how will that positively impact performance, control, and costs? Your organization has decided to empower its growth through an Internet of Things (IoT) solution. What defines success in launching your first solution? You need a reliable partner who will allow to easily pilot and scale your connected devices, manage your resources anywhere – all from one platform. Join us for an Aeris webinar where we introduce and address three common challenges for expanding a company’s capacity to deploy, maintain, and manage IoT devices and services throughout the entire lifecycle. • Use innovative IoT platforms to standardize processes involving distributed supply chains. Whether your company is on the cusp of expanding IoT solutions globally, engaged in IoT technology transitions, or seeking to reduce the inefficiencies associated with the absence of mature IoT management processes, this webinar will provide clarity and a framework for identifying emergent solutions. Roambee faced multiple challenges on its cold chain IoT deployment. This webinar describes how they overcame global scaling; visibility across eight geographical regions; updated its technology; and used a single provider for all connectivity concerns. Visit and listen to our webinar to see how all that was accomplished. Future generations of wireless connectivity systems will surpass what we have available today. And that future is not too far off. To make better use of the available cellular spectrum, companies will sunset existing protocols for newer, faster, and more secure technologies. Join Aeris for this live webinar where we will outline the benefits, challenges, new pathways, and unlimited opportunities of IoT connectivity, WAN, and 5G. • Future generations of wireless connectivity systems: Surpassing what is available today. • Rethinking the spectrum: Greater speeds, more data, security issues, and what it means for businesses. • 5G and WAN: Creating new use case opportunities with advanced technologies.